Claim a Daily Summer Bonus and Enchanted Free Spins! There was something magical about summer as a child: the promise of endless mischief and spending time outside playing in the garden. 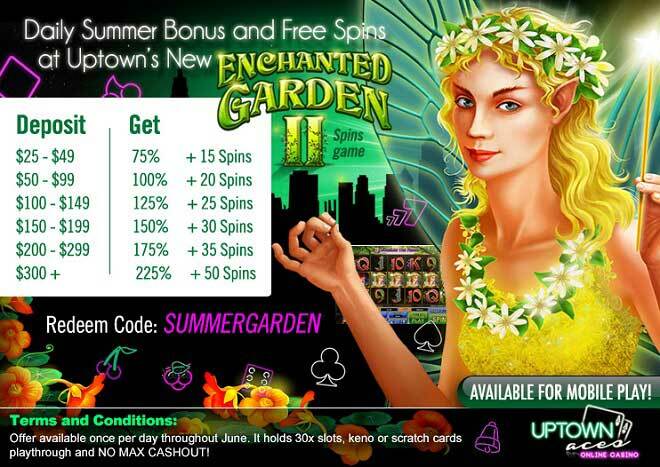 That same feeling is back with an extra goodness this summer Uptown when you deposit as little as $25 to play in a special and magical place with the perk of adding up to a 225% Match and 50 Free Enchanted Garden II Spins! It’s the perfect time of the year to spend your days and nights getting lost in the 5 reels of Enchanted Garden II. The sequel to the already successful and very popular slot machine game is packed with fairy-like winning chances with the help of bonus rounds, multipliers, free spins and other charming summer delights. Get ready to deposit as little as $25 to relive your favorite summertime memories while you spin the reels with up to a 225% Match and 50 free enchanting spins!